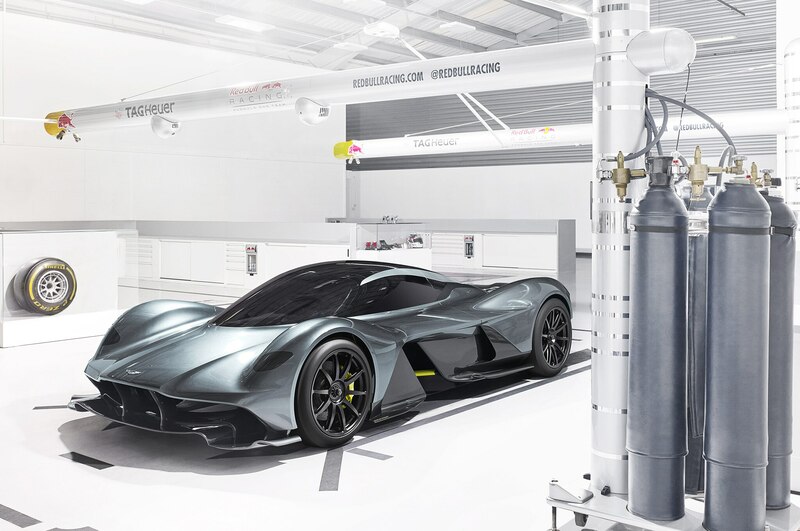 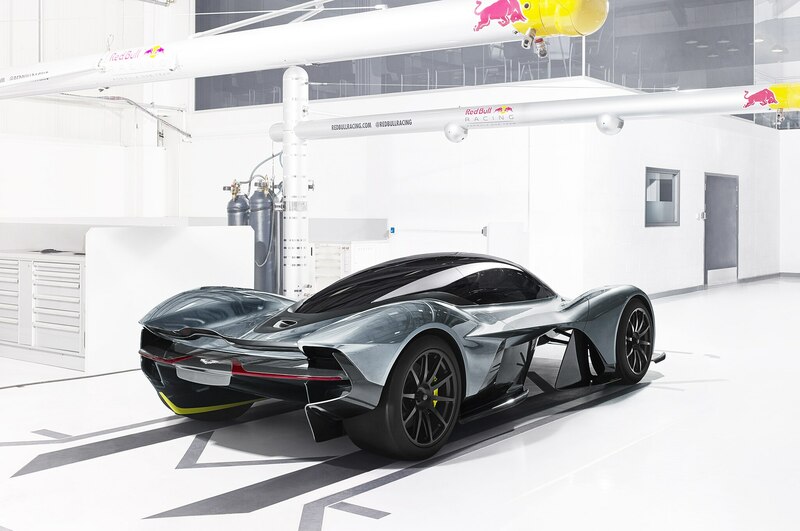 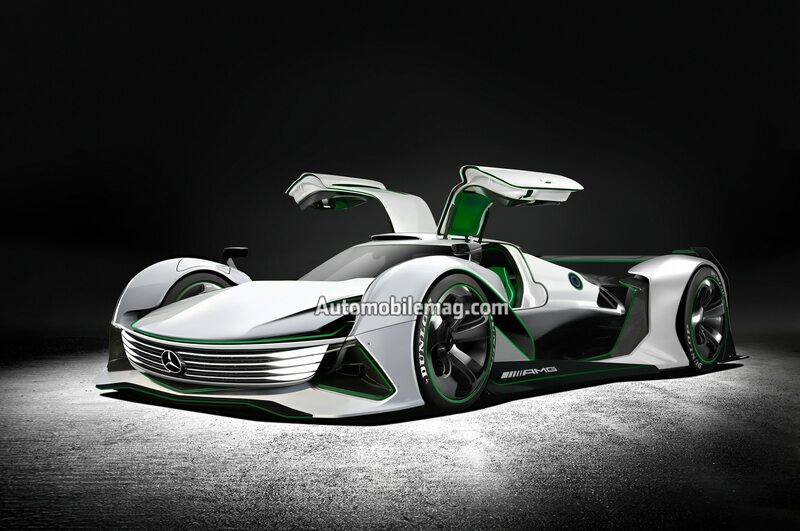 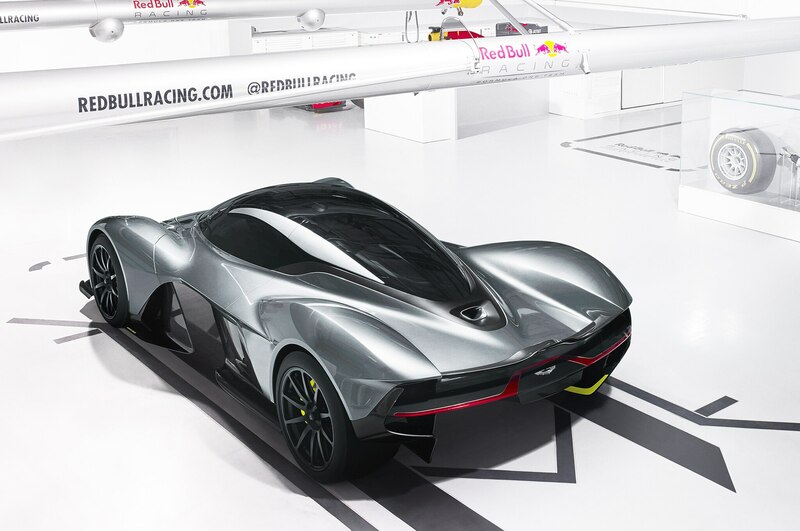 Not to be outdone by Formula 1 rival Red Bull Racing’s collaboration with Aston Martin to build the Adrian Newey-designed AM-RB 001 hypercar, Mercedes-AMG is working on an equally radical machine of its own. 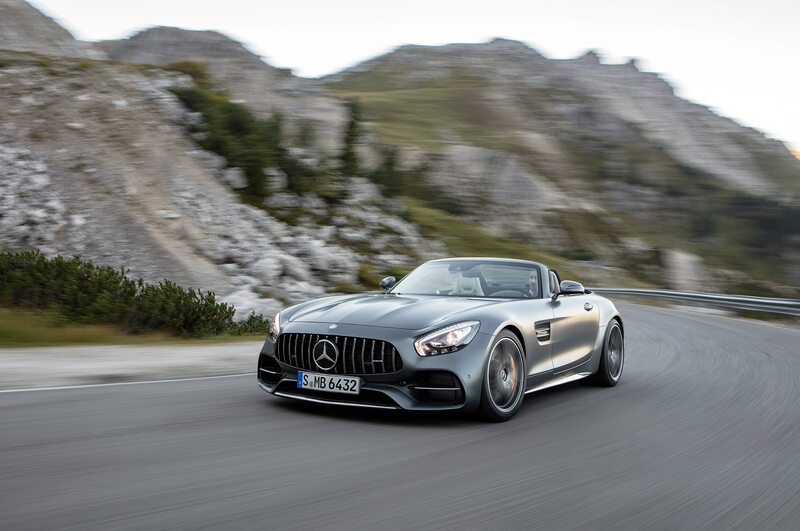 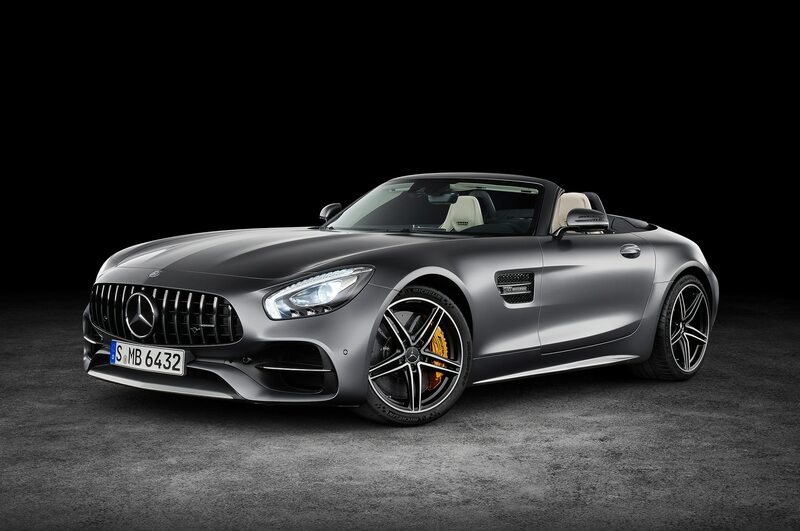 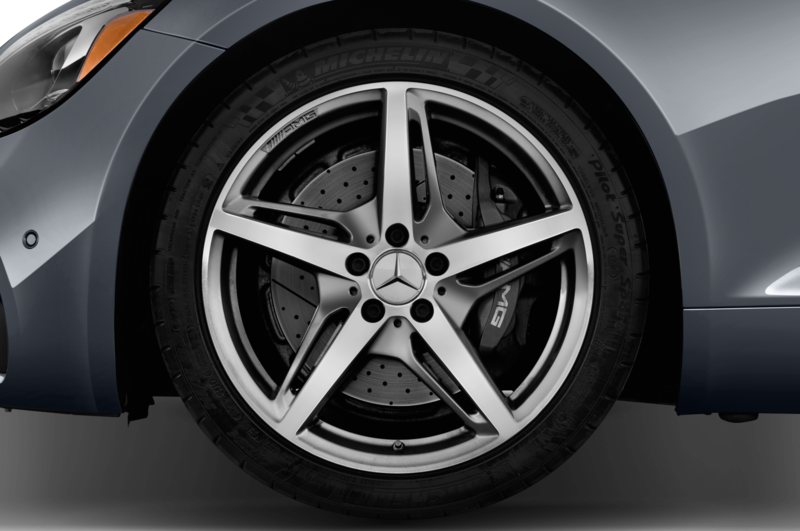 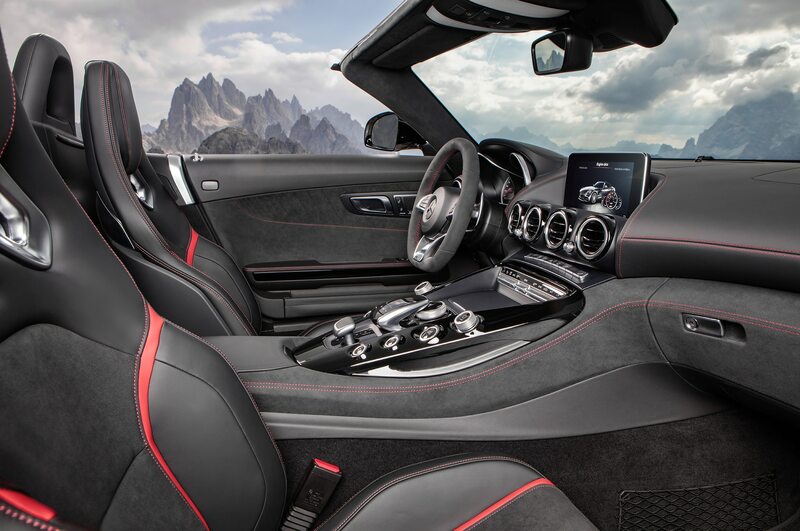 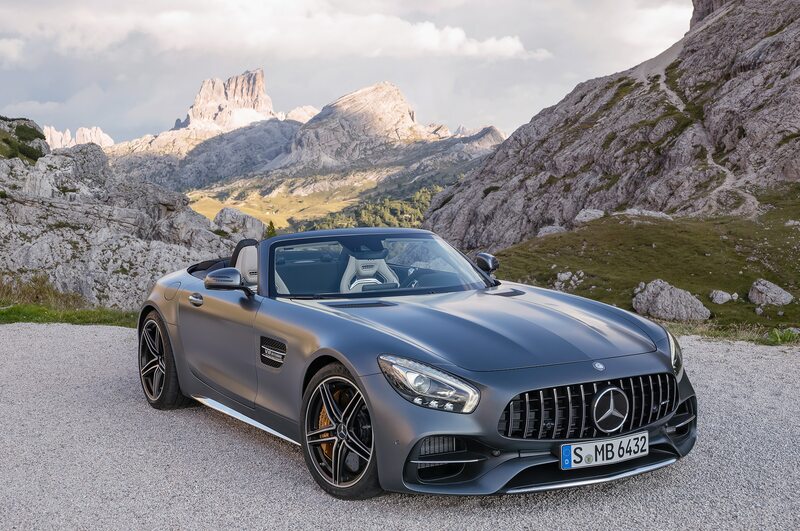 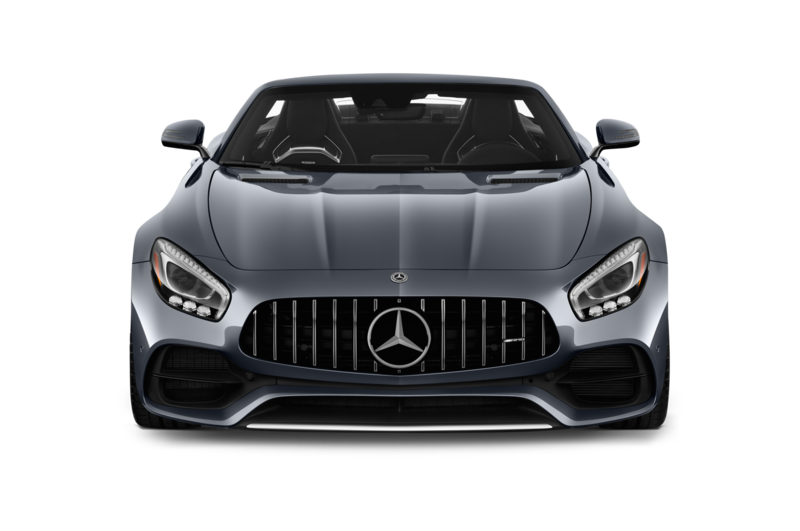 Dubbed R50 by AMG insiders, the car features a carbon-fiber monocoque, a sub-2,900-pound curb weight, and as much as 1,300 horsepower. 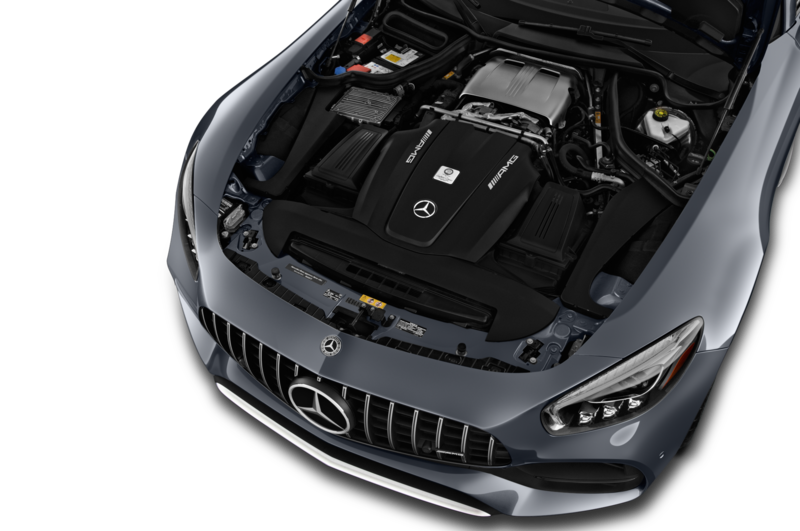 The R50’s powertrain is being developed by Mercedes AMG High Performance Powertrains, the same company that builds the complex hybrid power units for the Mercedes AMG Petronas F1 cars. 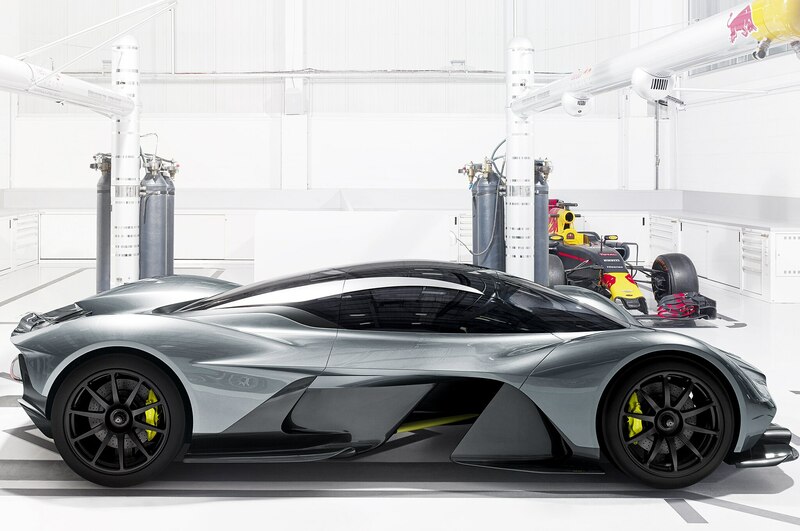 It is rumored to use a mid-mounted, 2.0-liter turbo four (though an F1-inspired V-6 is possible) with an unreal 1,000 horsepower, boosted by three electric motors; two at the front wheels and a third in the transmission housing. 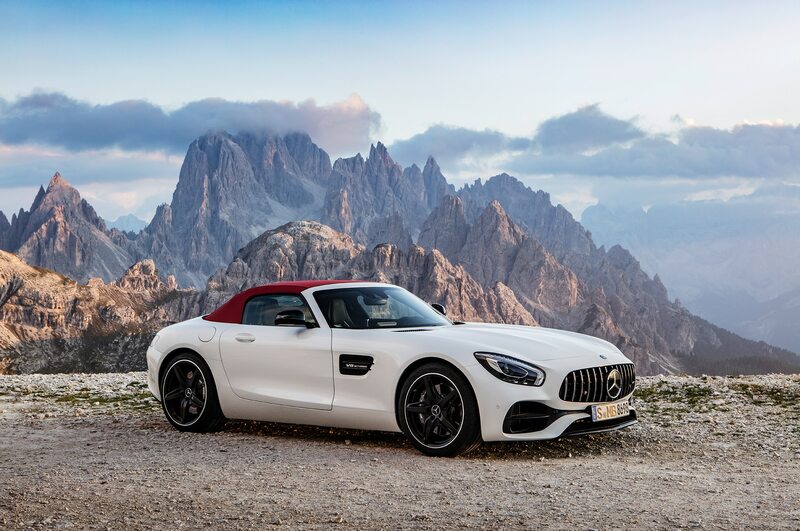 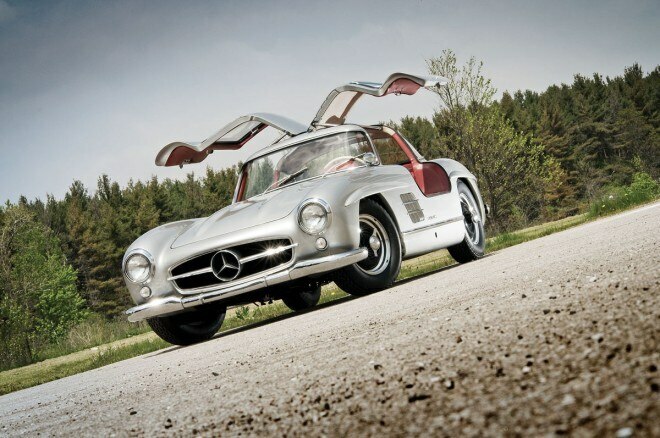 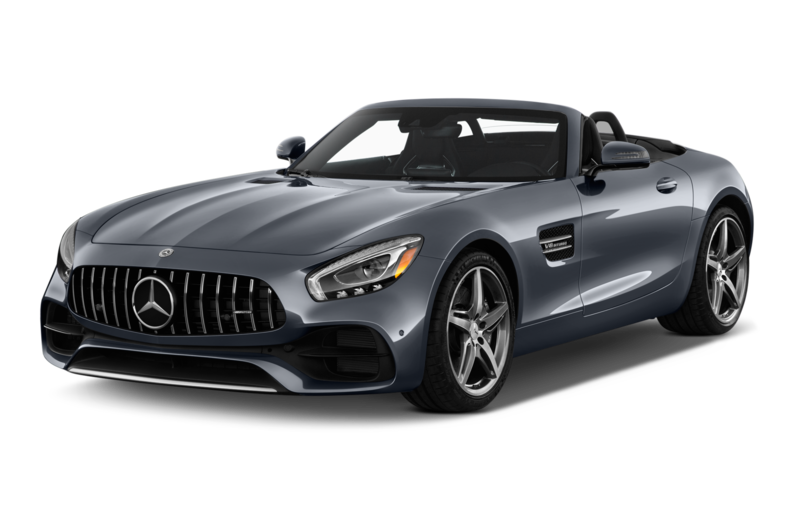 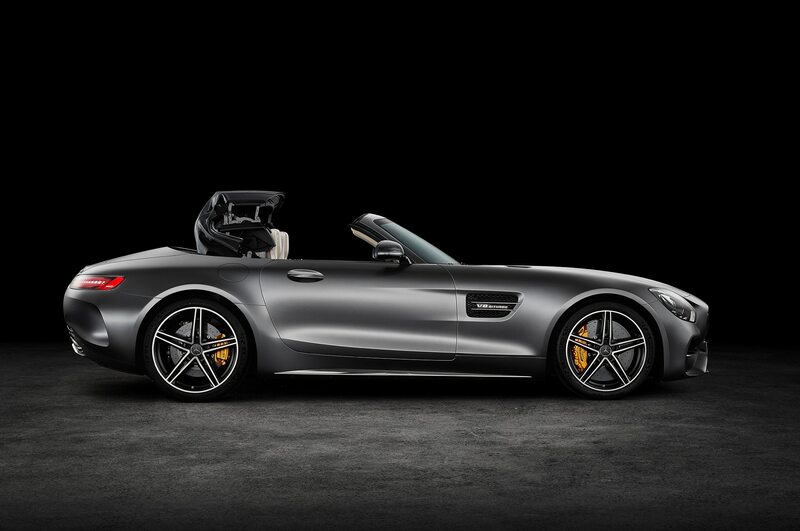 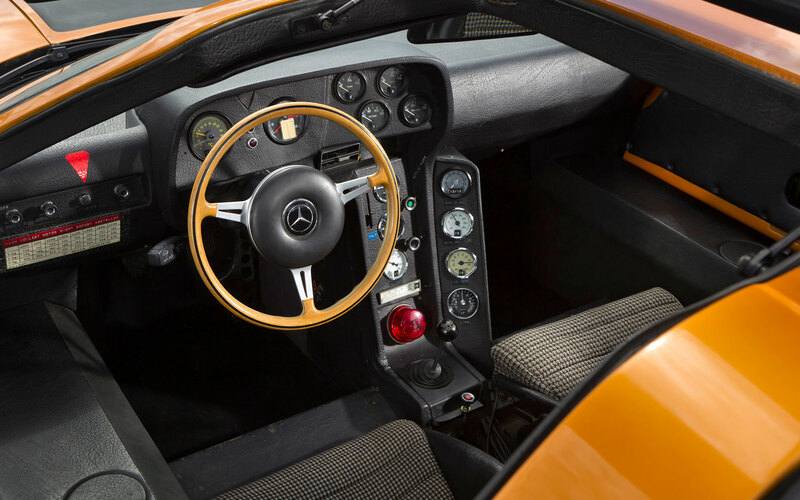 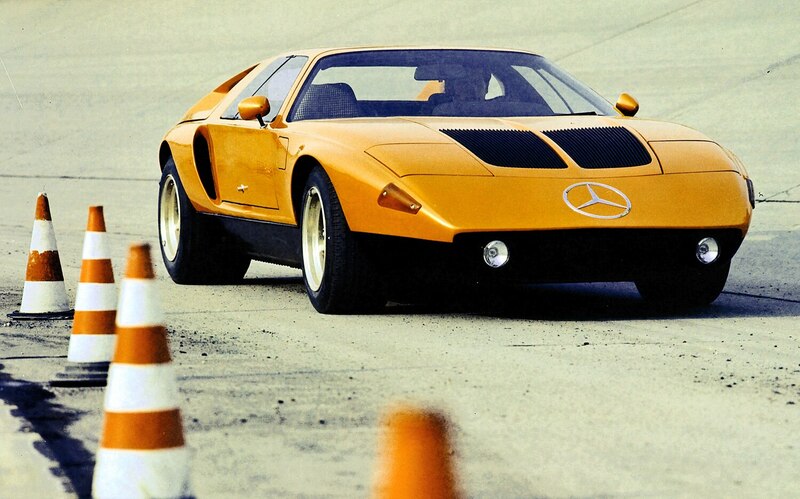 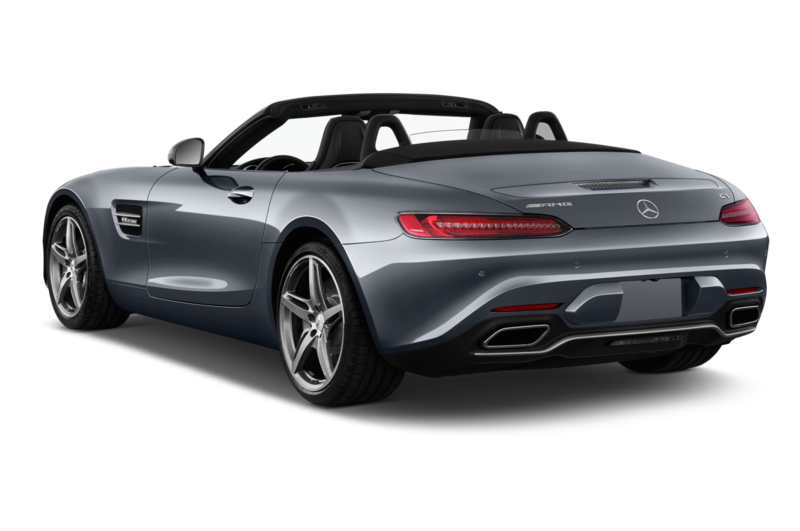 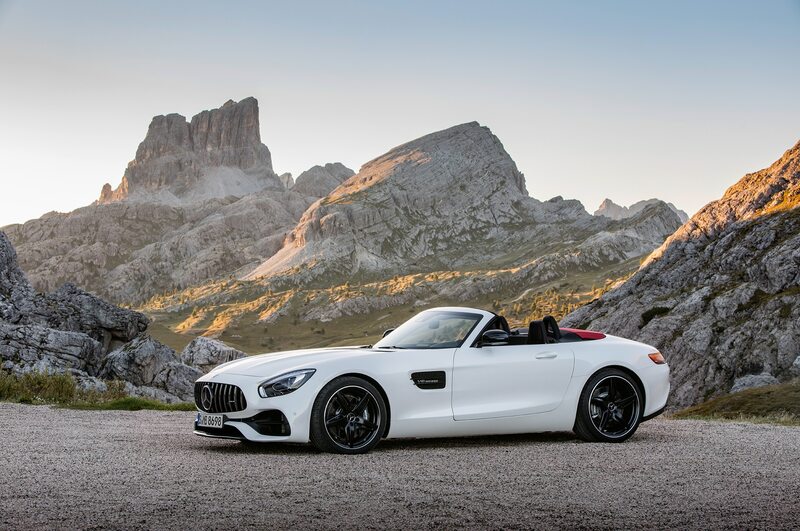 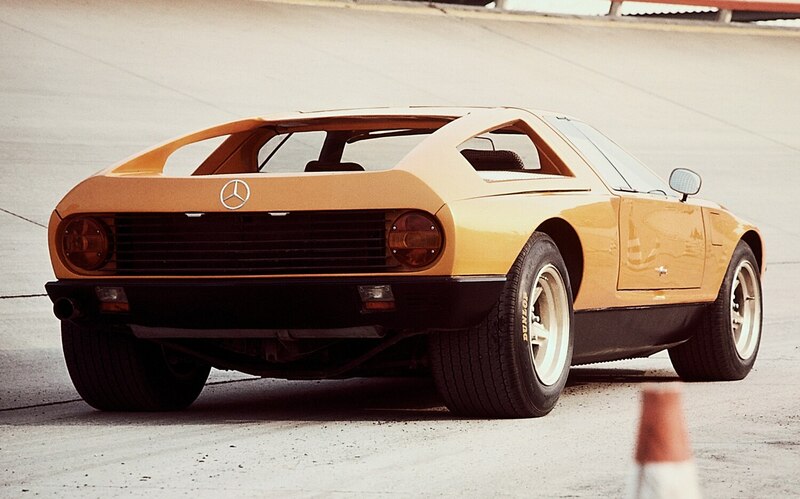 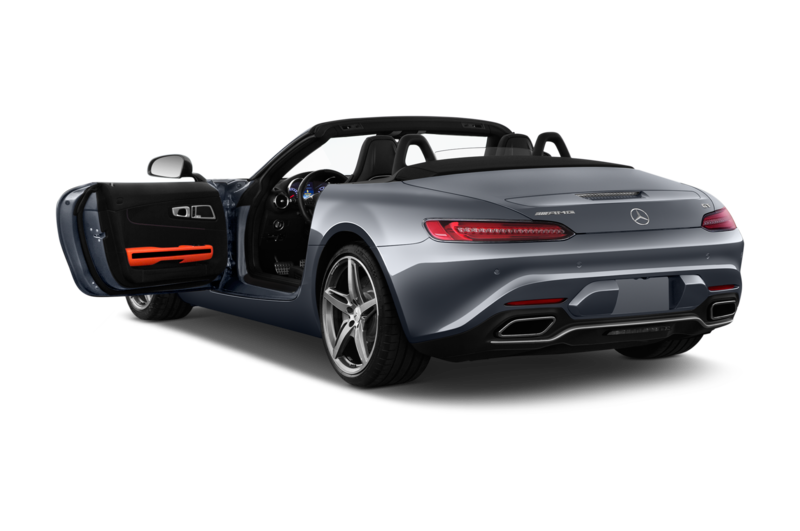 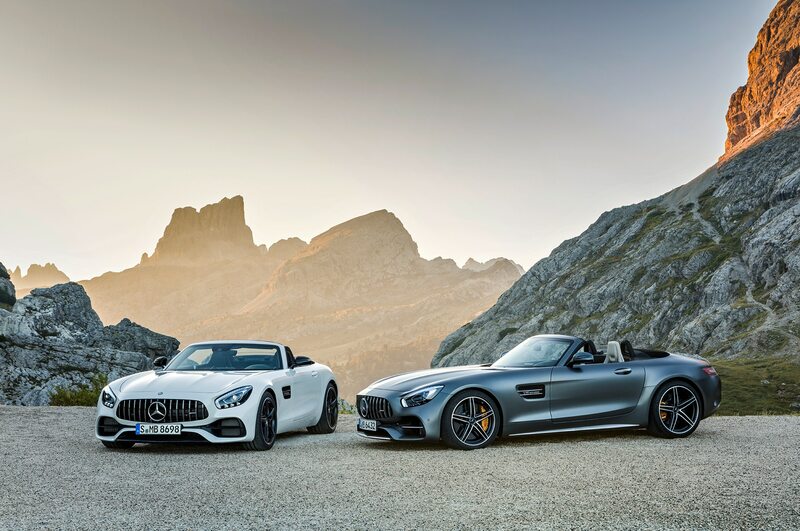 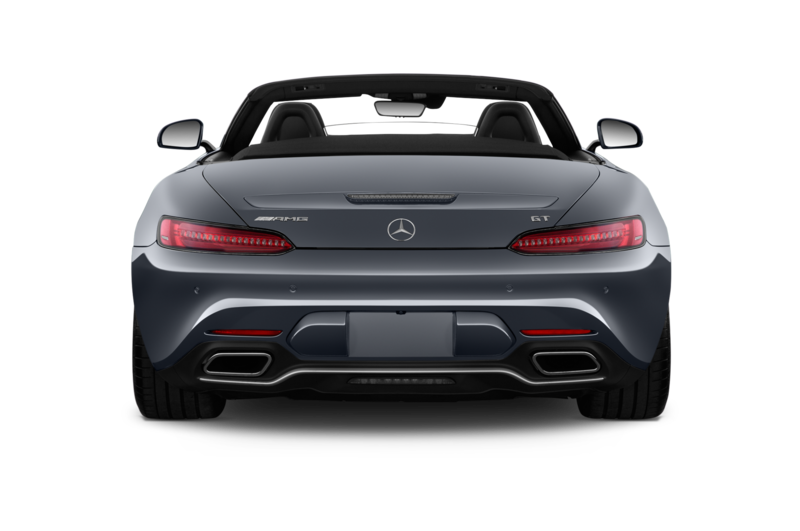 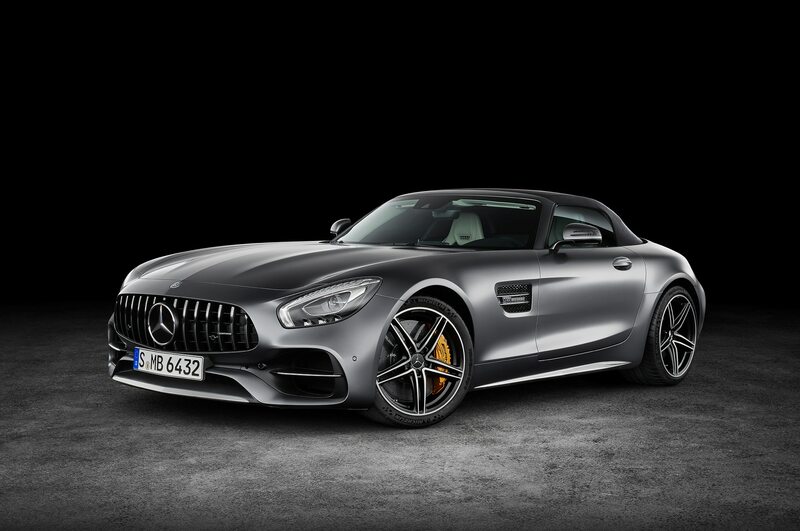 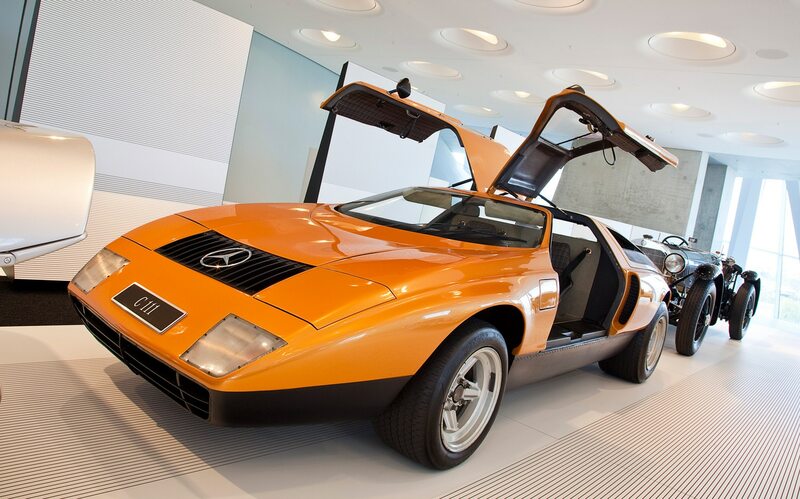 In design terms the AMG R50 resembles a hardtop Le Mans prototype racer, with vestigial gullwing doors that nod to Benz’s iconic 300SL and its C111 and C112 mid-engine concepts. 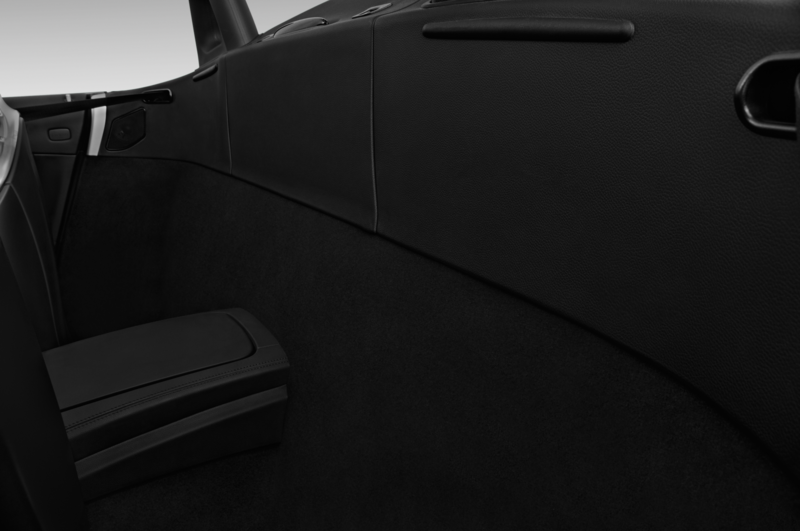 Driver and passenger sit low in a transverse tub, feet stretched out almost horizontally. 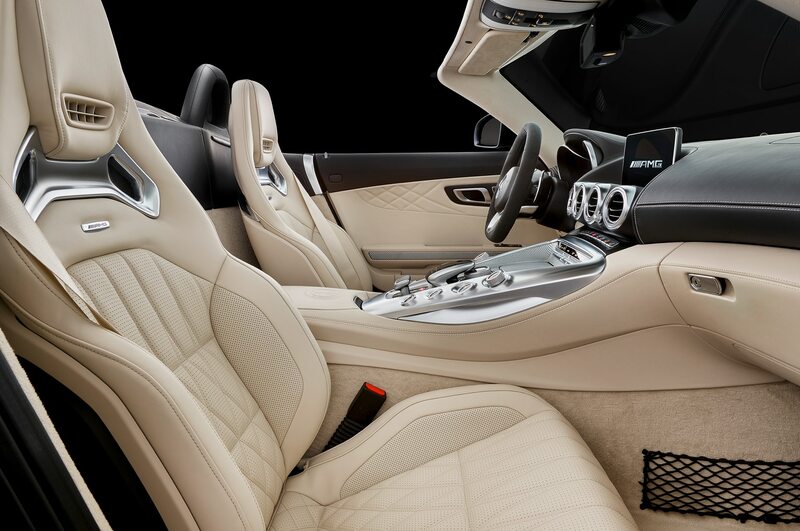 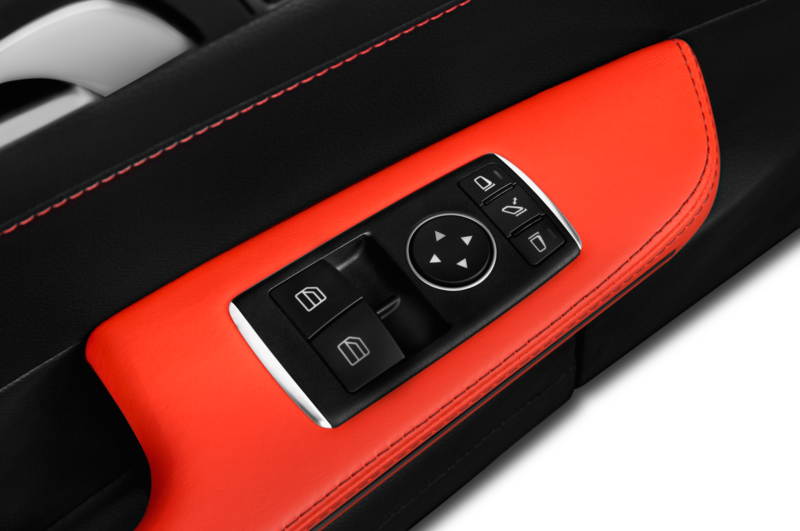 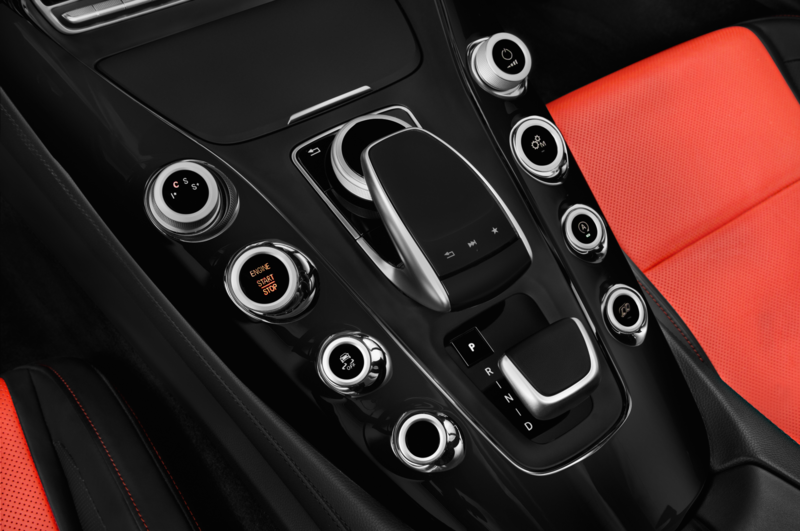 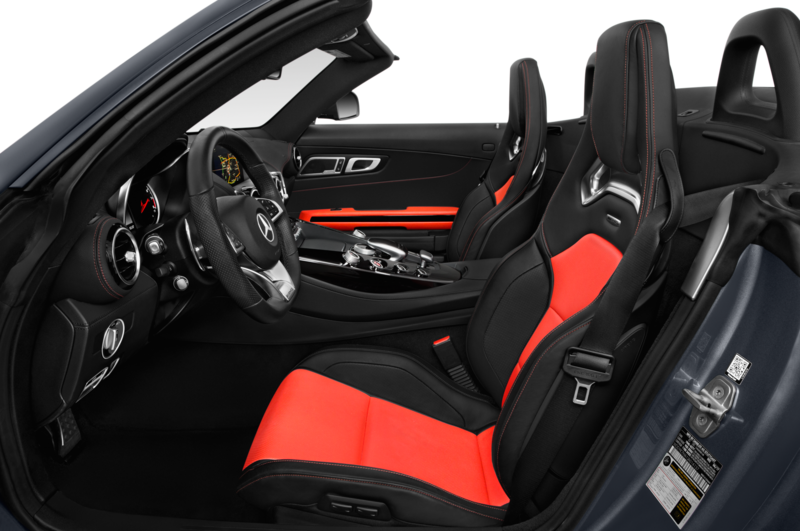 The pedals and steering wheel are fully adjustable, and the seats are lined with inflatable elements that adjust to accommodate drivers of different shapes and sizes. 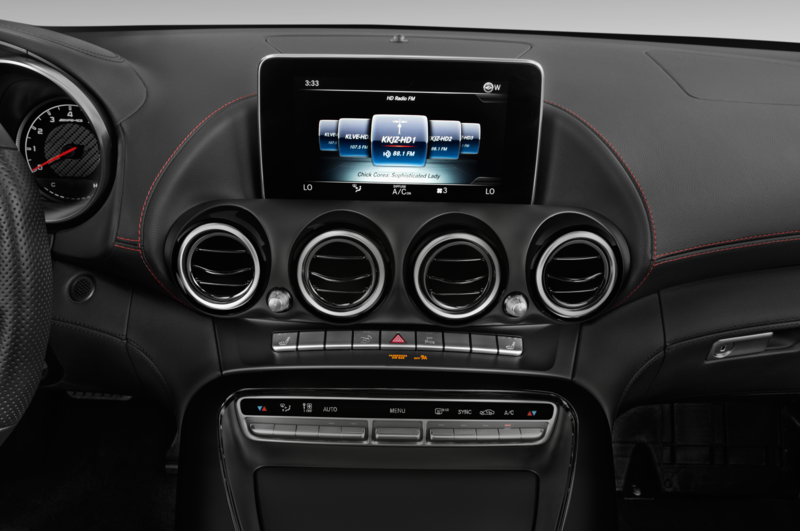 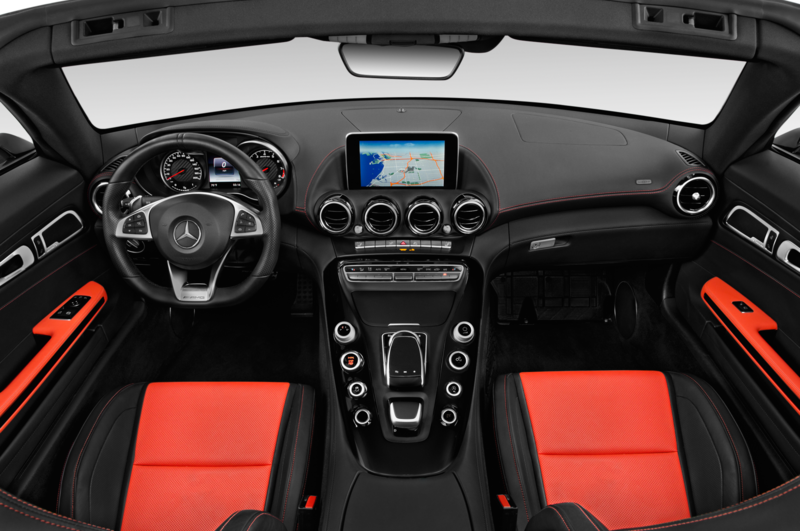 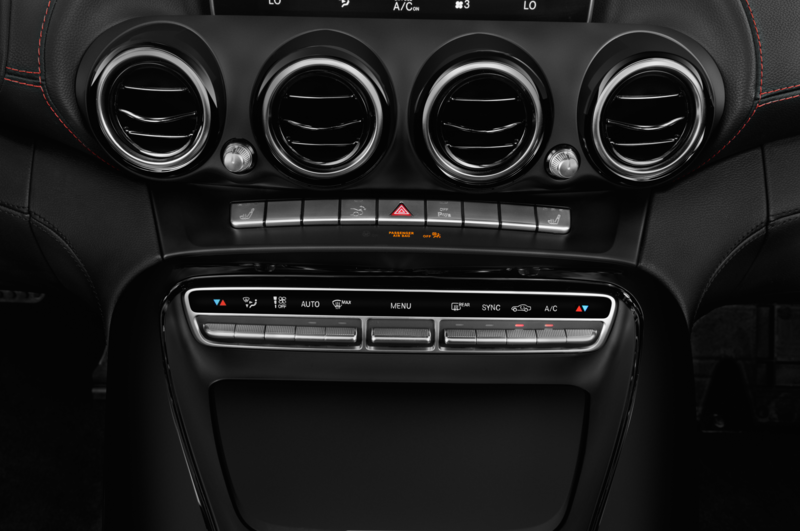 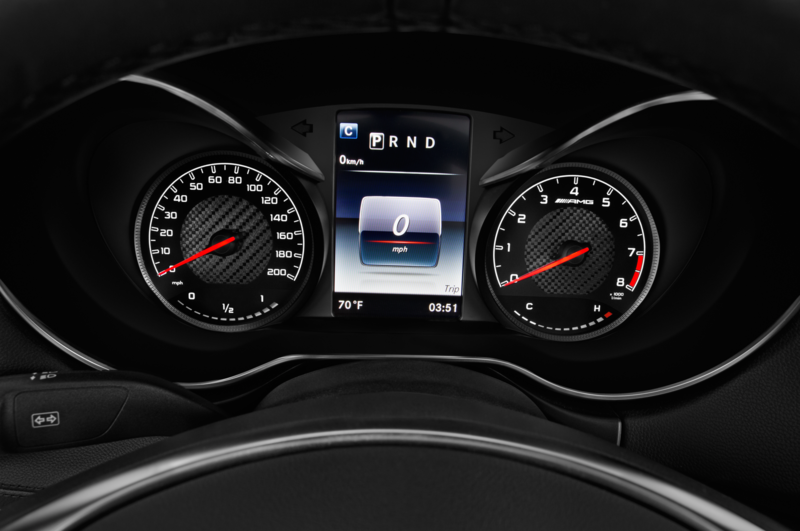 There is no conventional instrument panel; drivers instead rely on a head-up display and an LED tach. 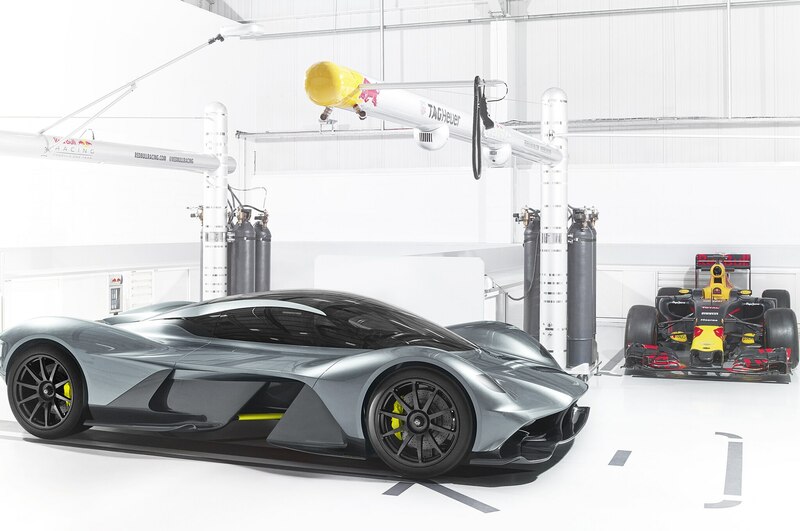 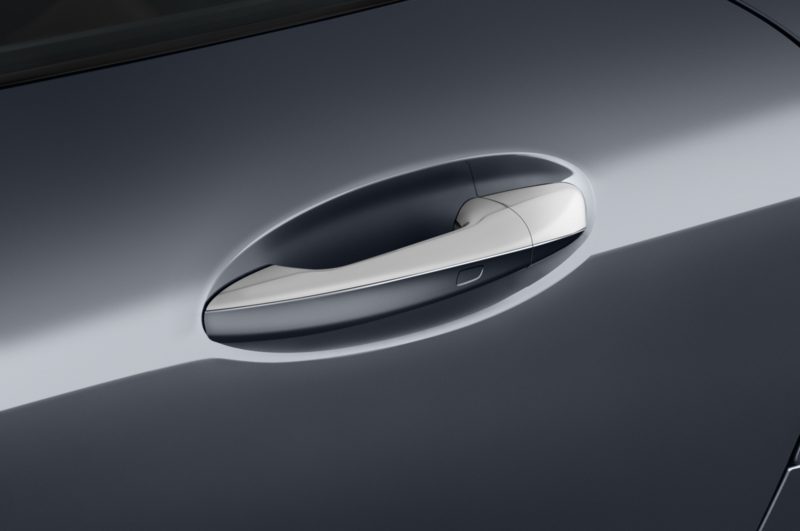 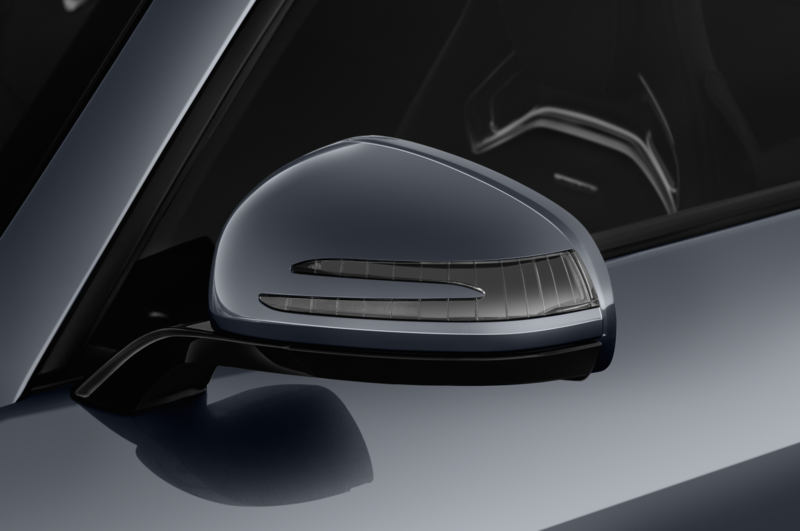 The car will feature active aerodynamics, with adjustable front flaps and a ground-effect floorpan design. 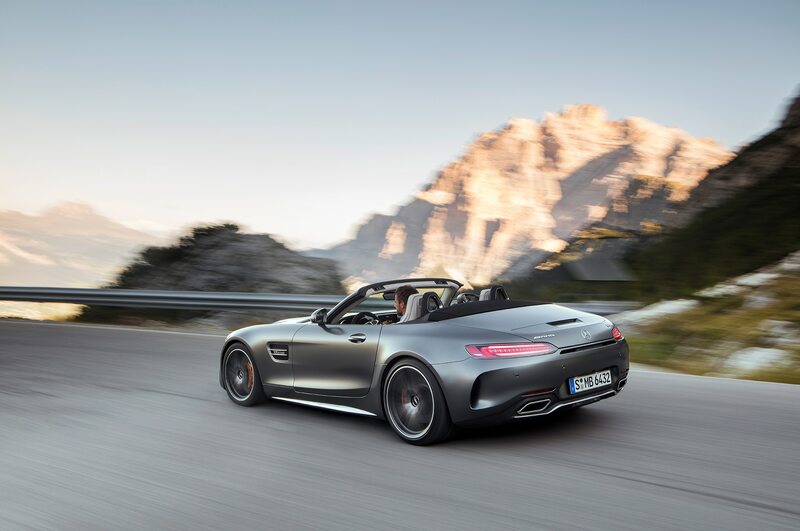 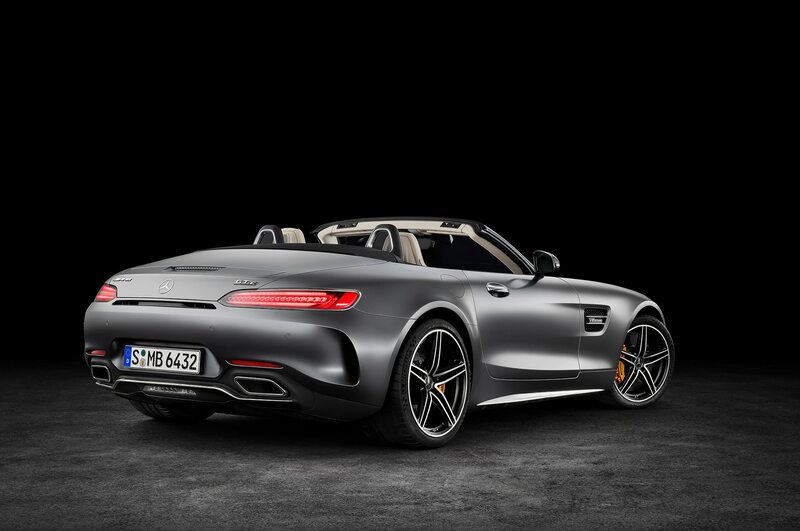 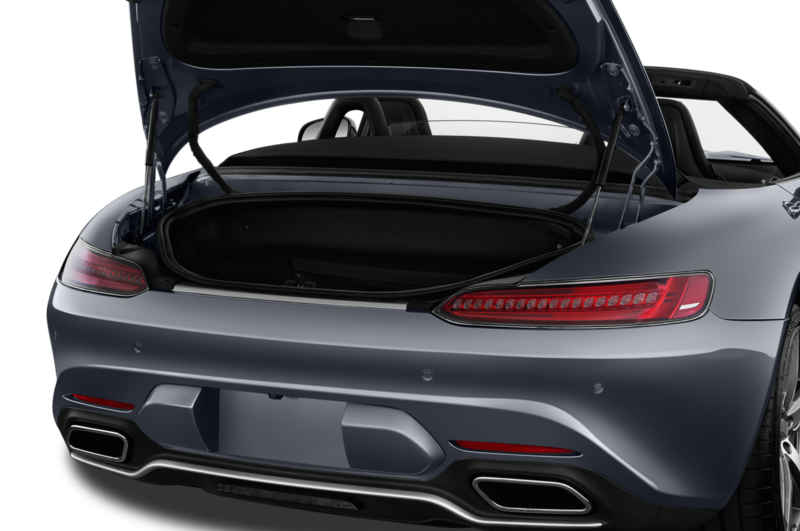 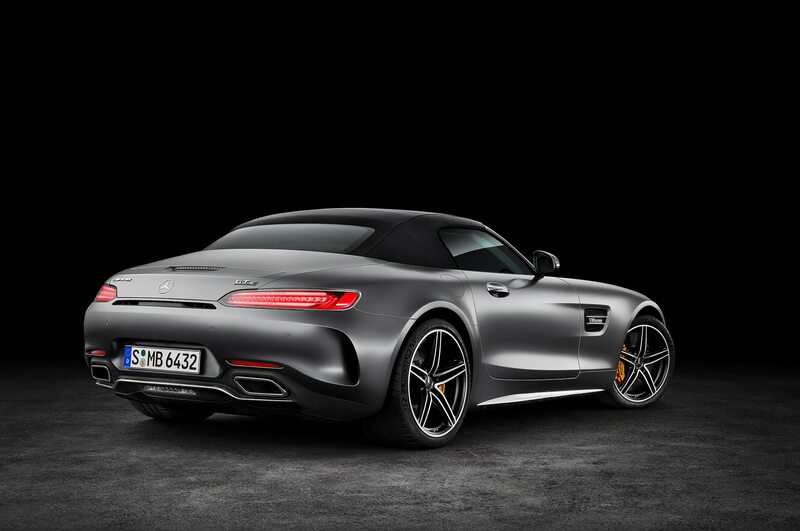 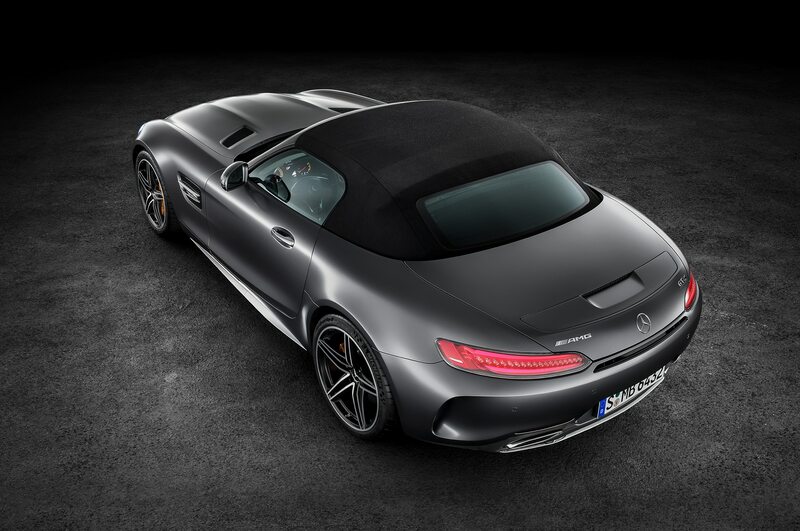 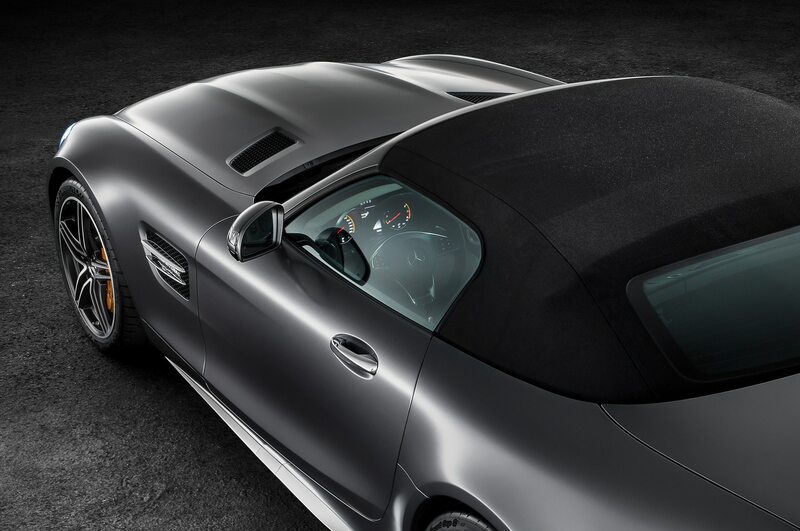 Its multi-functional rear spoiler can switch to low-drag mode at high speed, support cornering stability by means of downforce-enhancing air blades on both sides, adjust the front-to-rear aerodynamic balance, and act as an air brake. 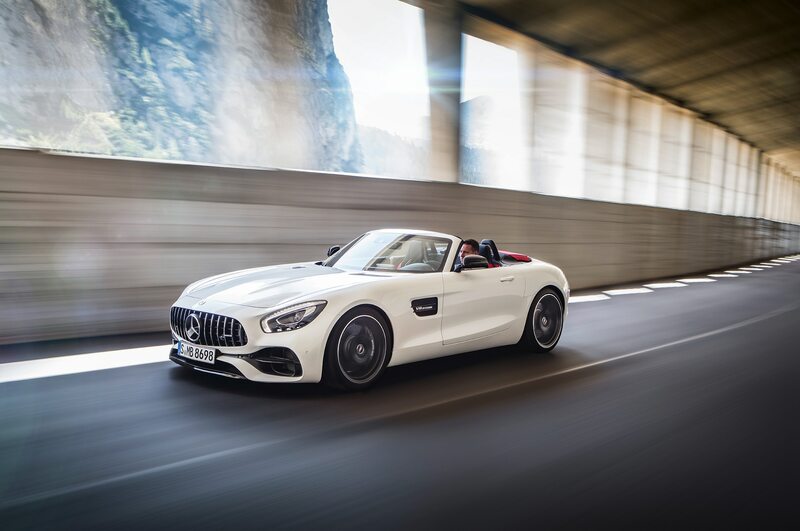 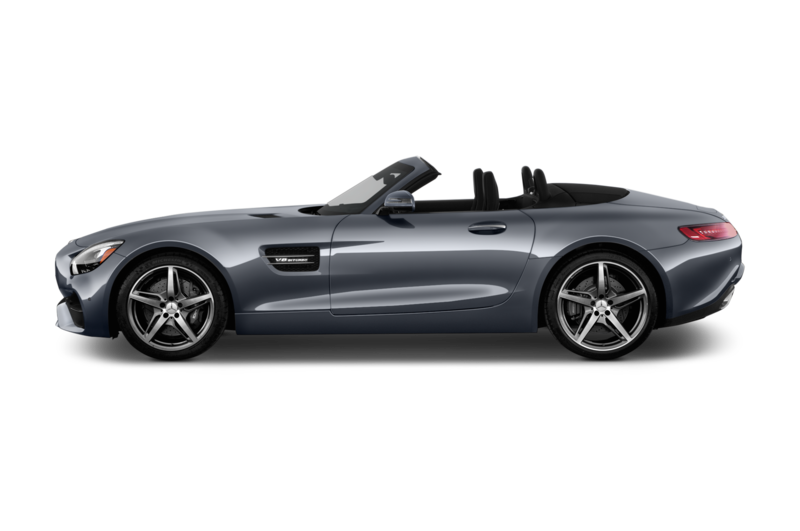 Daimler engineers are also working on algorithms that assess the driver’s abilities and gradually increase available longitudinal and lateral acceleration as the driver becomes more comfortable and confident behind the wheel. 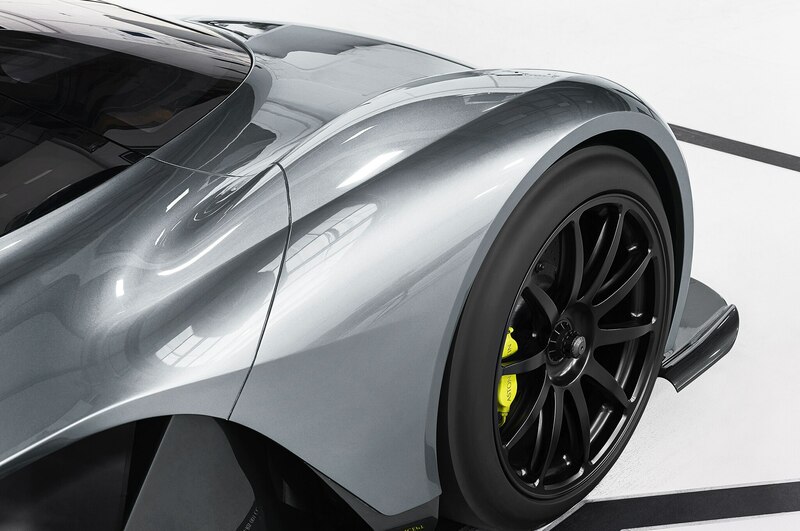 On the track, the R50’s on-board computers will be able to select the fastest line as well as optimum brake and turn-in points, aided by a fully variable active suspension with torque vectoring and rear-wheel steering. 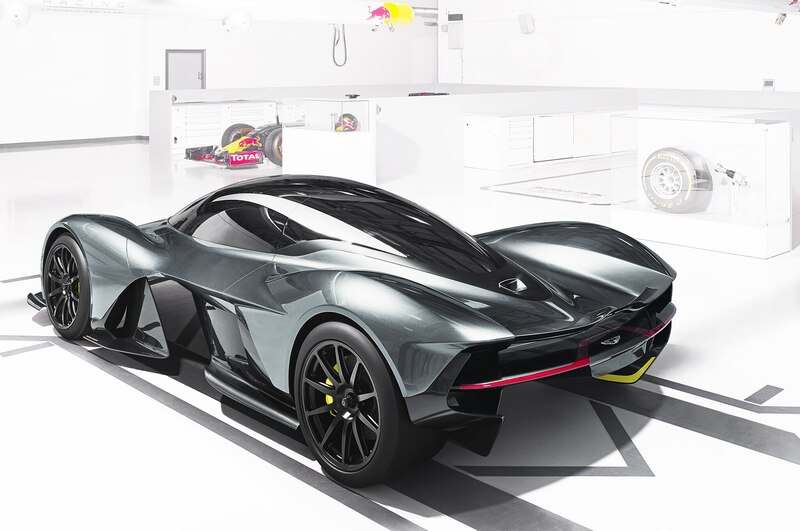 Top speed isn’t the R50’s bag—beating the AM-RB 001 around a road course is. 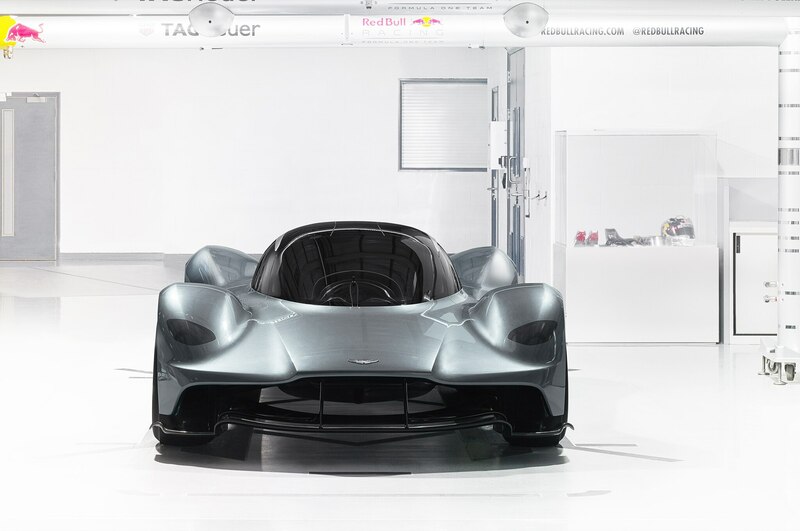 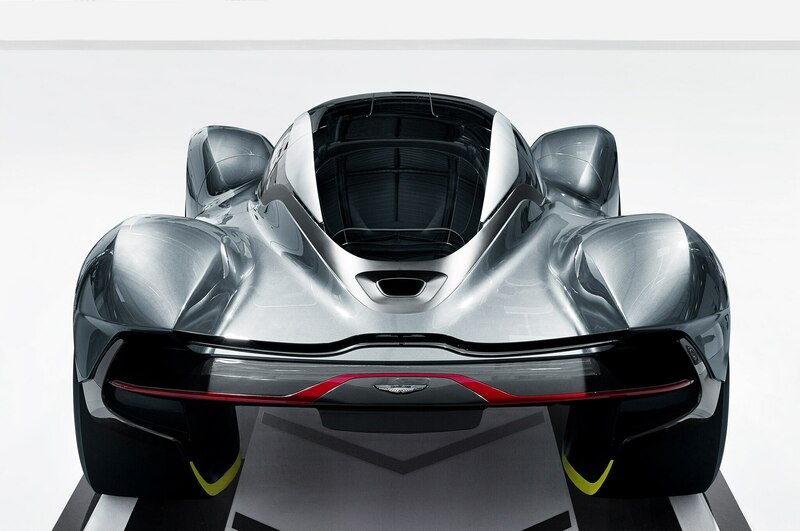 As with the Aston, the exact edge of the performance envelope will be determined by currently available tire technology, but expect the R50 to hit 60 mph in about 2 seconds on its way to a top speed north of 220 mph. 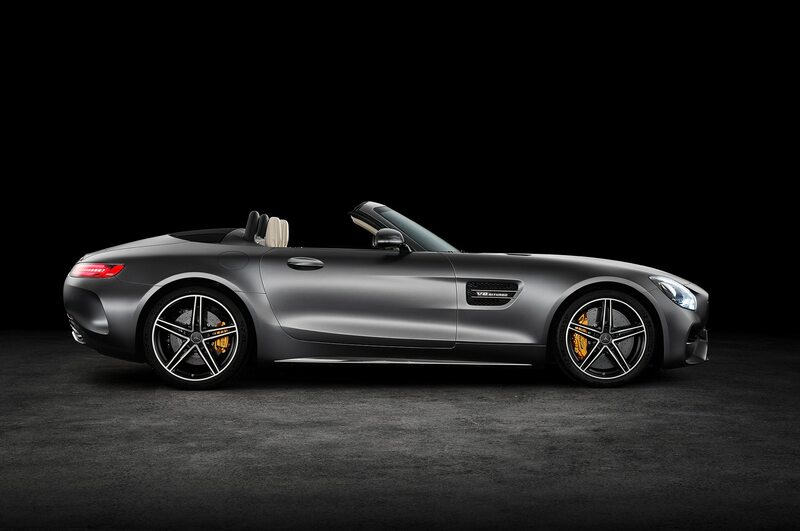 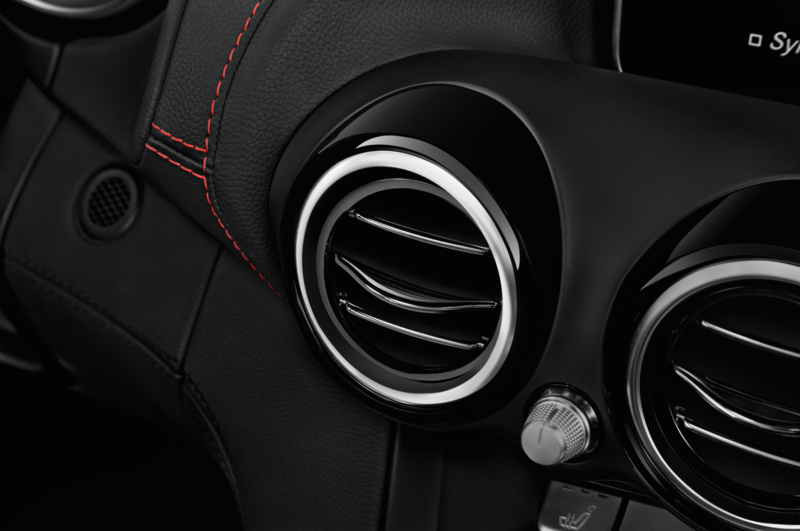 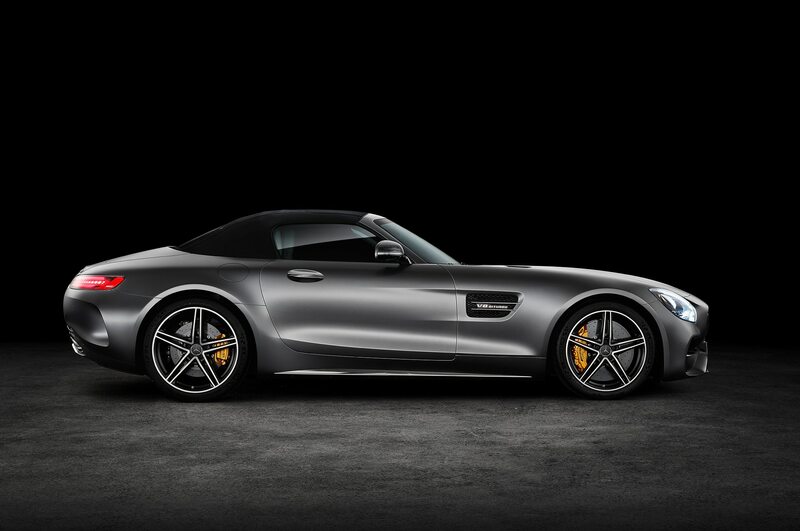 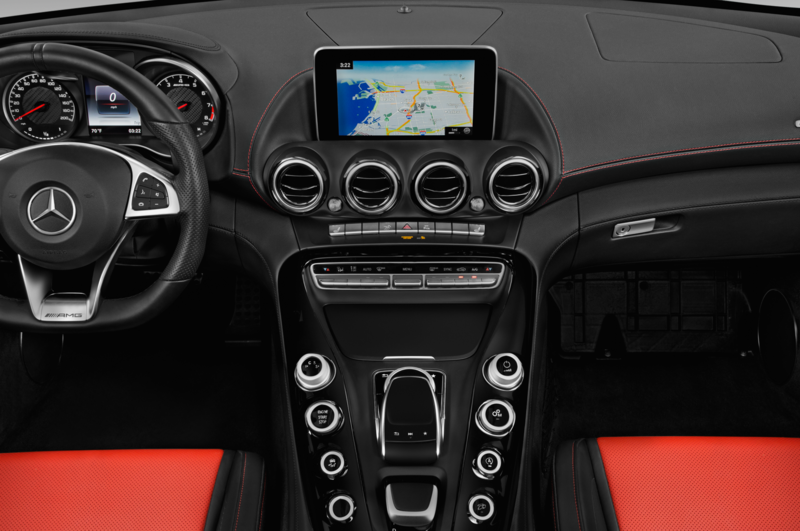 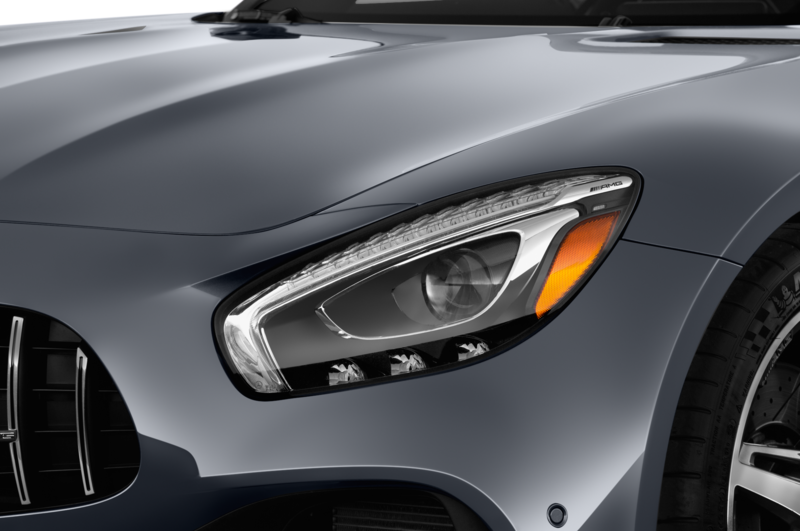 We’ve rendered the R50 here, but it will debut soon at this year’s Paris auto show to celebrate AMG’s 50th anniversary. 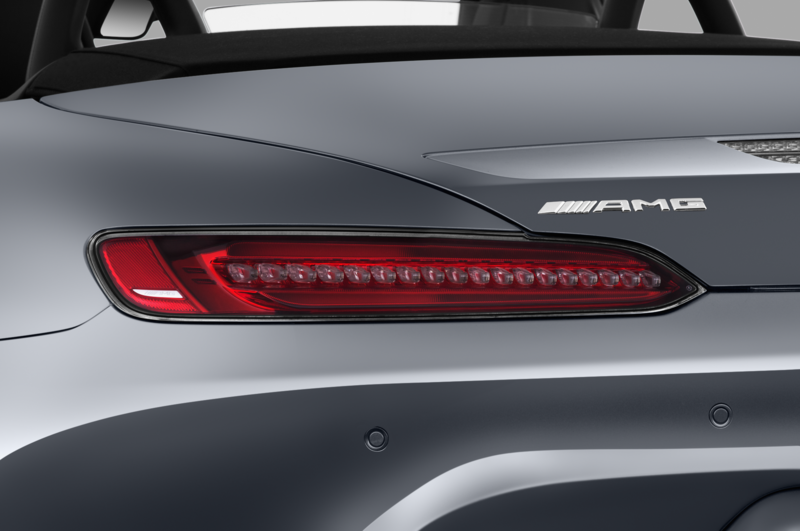 The Daimler board approved the R50 as a one-off concept, but AMG boss Tobias Moers wants a production run of 25 to 250 units. 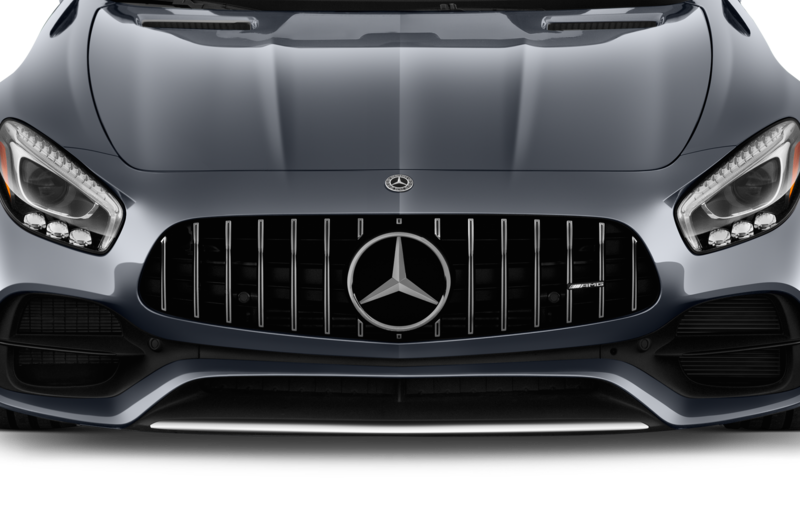 With the automotive landscape shifting rapidly toward electrification, at least two Daimler board members are in favor of developing an all-electric or fuel-cell-powered hypercar instead of a hybrid one. 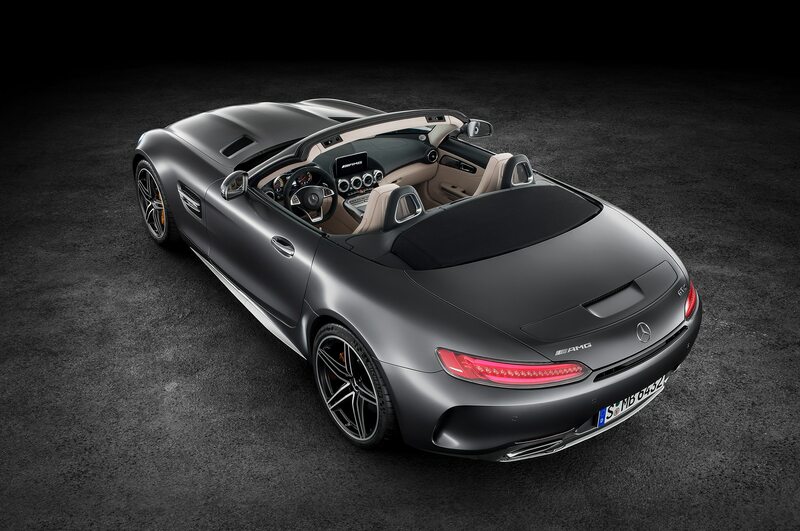 We’ll have to see how or if the program moves forward once the R50 shows its face.